Literature Fanatic. Writer. I tend to lean toward mystery and fiction, but I like to change patterns with the occasional YA or non-fiction book. I hope you enjoy my reviews and they inspire you to read the book yourself! Summary (from flap of Bantam Books version): Paris, France: September 1929. For Harris Stuyvesant, the assignment is a private investigator’s dream - he’s getting paid to troll cafes and bars of Montparnasse, looking for a pretty young woman. The American agent has a healthy appreciation for la vie de boheme, despite having worked for years at the U.S. Bureau of Investigation. The missing person in question is Philippa Crosby, a twenty-two-year-old from Boston who has been living in Paris, modeling and acting. Her family became alarmed when she stopped all communications, and Stuyvesant agreed to track her down. He wholly expects to find her in the arms of some up-and-coming artist, perhaps experimenting with the decadent lifestyle that is suddenly available on every rue and boulevard. As Stuyvesant follows Philippa’s trail through the expatriate community of artists and writers, he finds that she is known to many of its famous - and infamous - inhabitants, from Shakespeare and Company’s Sylvia Beach to Ernest Hemingway to the Surrealist photographer Man Ray. But when the evidence leads Stuyvesant to the Theatre du Grand-Guignol in Montmartre, his investigation takes a sharp, disturbing turn. At the Grand-Guignol, murder, insanity, and sexual perversion are all staged to shocking, brutal effect: depravity as art, savage human nature on stage. Soon it becomes clear that one missing girl is a drop in the bucket. Here, amid the glittering lights of the cabarets, hides a monster whose artistic coup de grace is to be rendered in blood. And Stuyvesant will have to descend into the darkest depths of perversion to find a killer … sifting through The Bones of Paris. -Bantam Books, 2013. After reading a bunch of novels featuring female protagonists and the focus on relationships, I thought it was time to move back into my favorite genre - mystery. I picked up this book at Barnes and Noble last year. It's one of my more recent choices. Since it, to my knowledge, is currently only available in hardcover, it also allowed me to make more room in my nightstand for all of the books I have yet to read. The author is female, but it's the first time in a long time that I have read a mystery novel that features a male protagonist. Looking back on it, Harris reminds me of a mixture of Humphrey Bogart and John Wayne, with more focus on the Bogart end of the spectrum. The John Wayne side is a rare animal and it only really shows up when Harris is fighting with other characters - again, rare instances, but they happen enough to leave an impression. As always, spoilers will be minimal. Basic Plot: Harris Stuyvesant is a private detective hired to find a missing girl. Throughout his search he meets many of the influential artists of the area and he comes into contact with many icons of late 1920s Paris. Over time, he comes to realize that the girl he's searching for isn't quite what she seems. At the same time, a murderer is silently moving through the streets, killing many and leaving little to no trace of evidence behind. Harris has to juggle both finding the girl and stopping the murderer before it is the body count gets any higher. Comments: This book has hints of noire. It also gives off the vibe of a Hitchcock movie. You never quite know where Harris will take you and you're not entirely sure if he's doing the right thing. For most of the novel, you know only as much as Harris knows - until there comes a chapter that is in another character's point of view. This is rare, but it provides key insight sometimes. The story itself was okay. It wasn't spectacular, but it wasn't horrible either. I felt that the story dragged a lot in the first third. A lot of it was telling, not showing. It was a lot of commentary on Paris, the citizens of Paris, the artists of Paris, etc. etc. After a while, I was thinking, "So, where's the murderer? Can we get to him already?" If King was trying to recreate the feelings someone might feel when they search fruitlessly for someone, she certainly achieved it. I felt as hopeless as Harris by the time the middle third began. Once the middle third began, the story picked up and flowed faster. Crucial events occur sooner and the climax just builds from there on. King chooses to bring famous people of that period into the novel, even if it's not entirely historically correct. For example, she brings Cole Porter into the story, even though in the afterword, she notes that he never would've been in Paris at that particular time (September 1929). She also includes mentions of Dali and Hemingway. Harris never speaks to them, but they are inserted into scenes from time to time. Man Ray is the only famous person who can be considered an important character/supporting character. Anyone who knows art or even just the Surrealist artists in particular will have more insight than the average reader. They probably would appreciate it a little more too. Surrealism is a crucial part of the mystery and it hints slightly at who the murderer is. This is definitely not your typical murder mystery. It's more suspense driven. If I had to equate it to something modern, it's like Cold Case or Without a Trace. The crime has already been committed and Harris and his partners just have to solve it. The mystery wasn't entirely predictable. There were some surprising twists and there were several plot threads that had you guessing. As for the solution itself, it's not mind-blowing or breathtaking. The climax isn't really climactic.It just is presented without much of a flourish. In that sense, I felt let down. I know that a bombastic announcement or reveal isn't the murderer's style so I can't blame King completely for this. She does a good job and when you're finished and you look over the novel as a whole, it does make sense. It just never inspired any nervousness or fear within me. I didn't feel as much a part of the action as I was a bystander. As far as characters go, King has good ones. She doesn't have a wide range of characters with names. She picks and chooses which characters are the more important ones to develop and give deeper roles to in the course of the novel. All of them have some fatal flaw or another, which is typical of a mystery, but also refreshing. You're hoping Harris finds the missing girl, but at the same time, you're not entirely sympathetic to him either. You sympathize with the side characters more. Overall, it's an interesting and cohesive mystery, but it fails to deliver the kind of satisfying punch mystery lovers commonly seek. 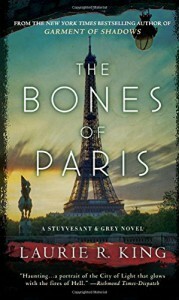 The Bones of Paris gets a B+ from me. Please support the author by buying the book in a bookstore or online. You can also borrow it from a friend or local library.